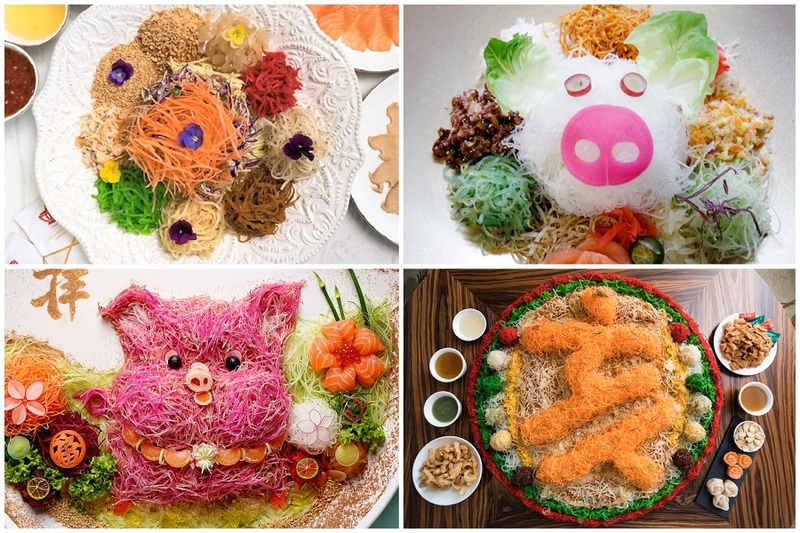 Here’s the Ultimate Yusheng Guide 2019 that you need for your Lo-Hei to “Huat” all the way this Chinese New Year. 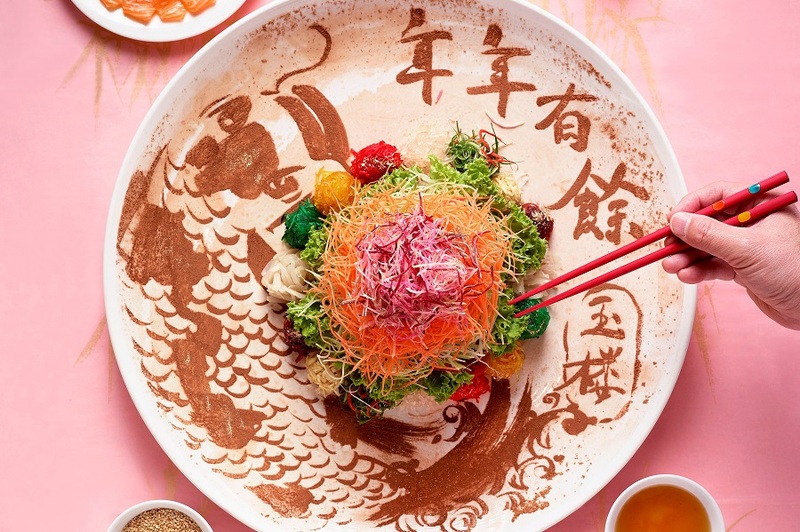 Fish (pronounced as “yu” in Chinese) which signifies abundance, is a sign of prosperity and Chinese believes that tossing Yusheng will bring in fortune in the upcoming year. 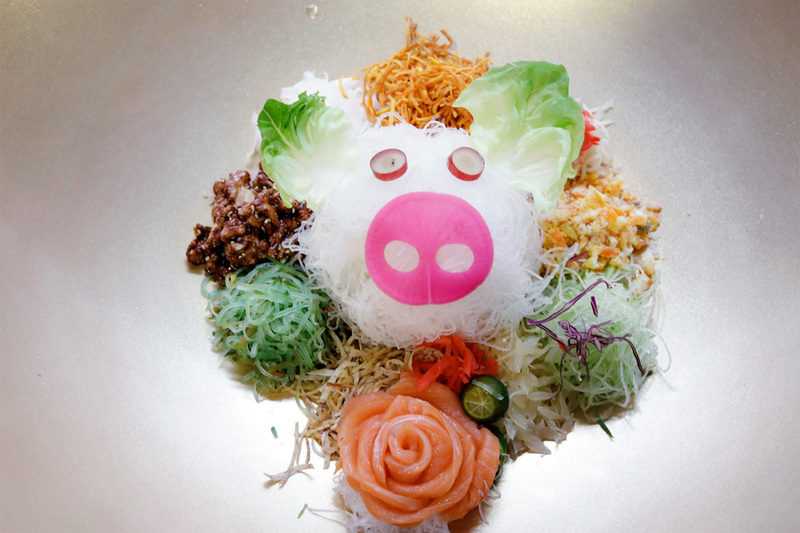 It has become a must-dish to have for any CNY celebrations, and of course restaurants are getting more creative in terms of presentation and flavours. If you are all out to impress, look out for the 1.5 Metres Wide Prosperity Yusheng from InterContinental Singapore; Special Piggy Edition Gold Rush Yu Sheng from The Fullerton Hotel Singapore; and luxurious Lobster, Sea Urchin, Hokkaido Scallop, Salmon, Tuna, Caviar & Crispy Fish Skin Yu Sheng from Singapore Marriott Tang Plaza Hotel. Interesting flavours you can expect include Thai-style Yusheng from COCA and Sawadee Thai Cuisine; and spicy Mala from Sakae Sushi. If health and sugar level is your concern, TungLok Group has introduced “Lower Sugar Yusheng” certified from HPB – the first in Singapore. Probably the biggest (60 inches wide) and most impressive Yusheng this year. 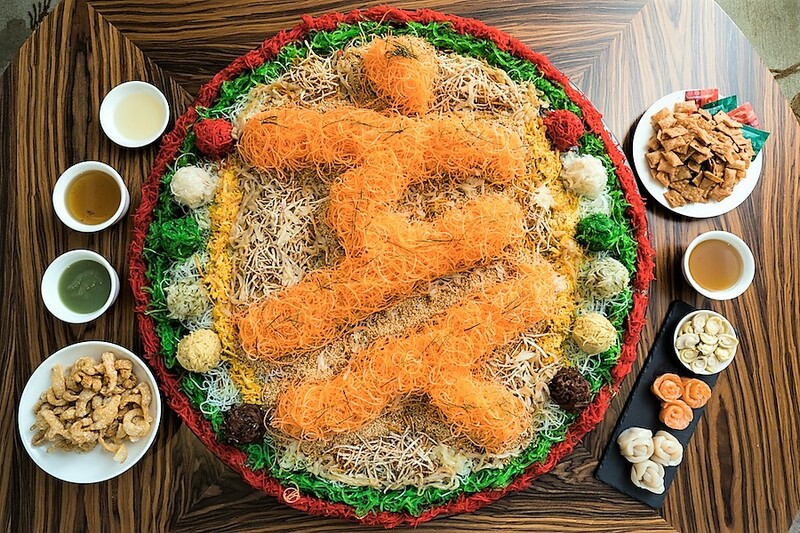 If you take a look at the Yusheng above, you would notice carrot strips shaped with the Chinese character “Hai” (亥) which represents the 12th branch, or the Pig in the Sexagenary cycle (天干地支). 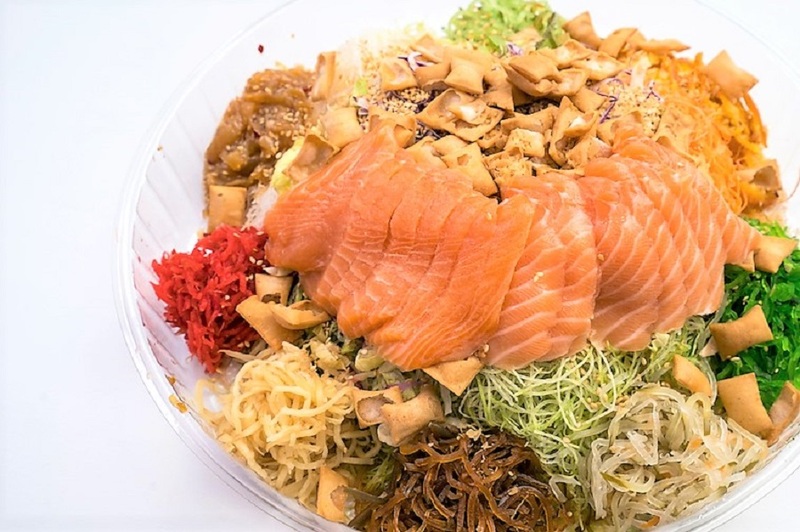 The other luxurious toppings on the Yusheng include Abalone, Hokkaido Scallops and Salmon – a mixture of quality seafood which represents “Nian Nian You Yu” (年年有余) or abundance. Another unique component is the addition of crisp pork crackling for crunch in texture, in celebration of the upcoming Year of the Pig. The apple sauce is fruity and refreshing on the palate. Note that the 1.5 metres wide Prosperity Yusheng is only available for dine-in. A lot of effort by the kitchen team to prepare this yusheng, so it’ll be good to gather a company of people for a feast. 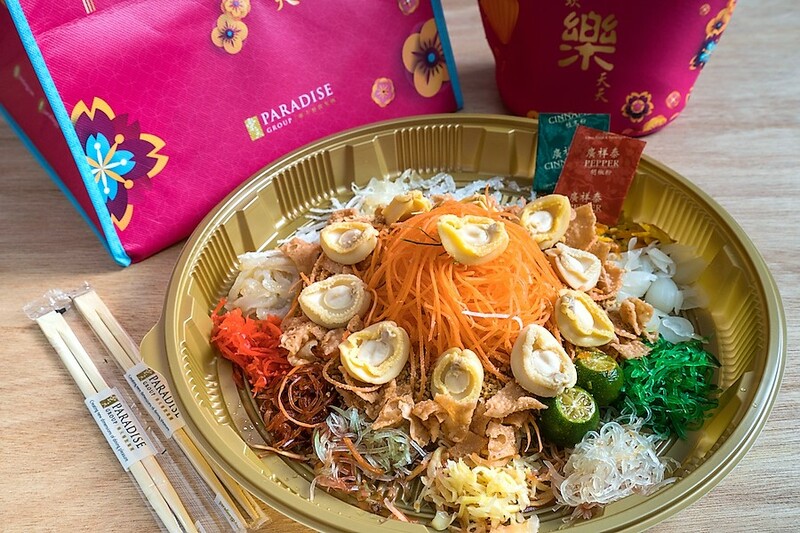 – Fortune Yusheng ($68 for 6pax/ $108 for 10pax). Available till 19 Feb 2019. 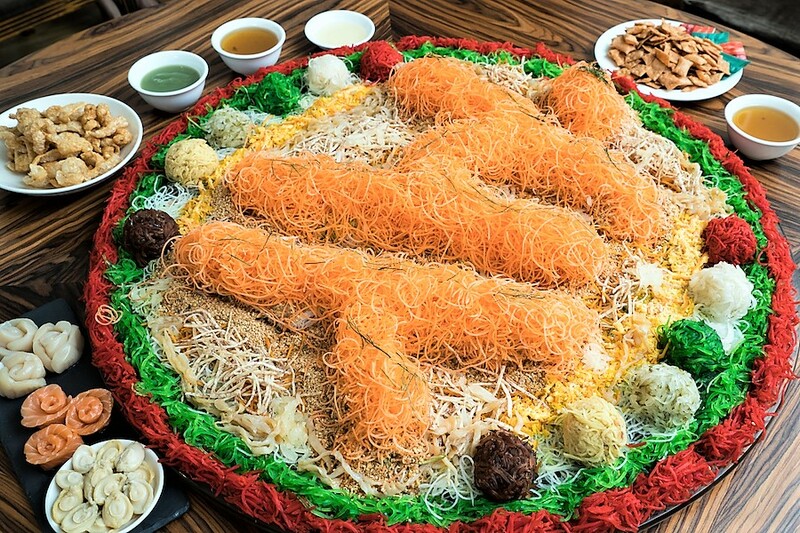 If you need a lavish Yusheng that would certainly impress your guests, this is it. The chefs at Wan Hao Chinese Restaurant have put together some of the best quality ingredients together in the same Yusheng, that is befitting even for grand celebrations. 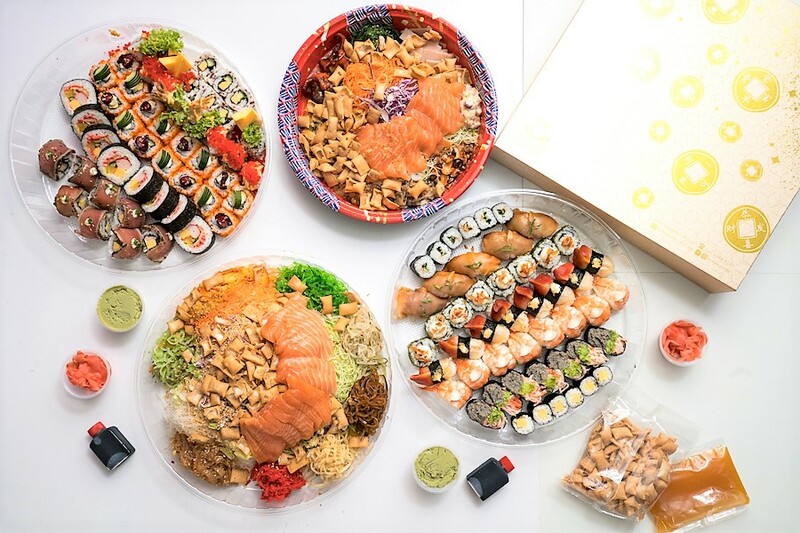 The decadent make-up include Lobster, Sea Urchin, Hokkaido, Scallop, Salmon, Tuna and Caviar – certainly the best of the best premium ingredients that we can safely call the “finest treasures of the sea”. 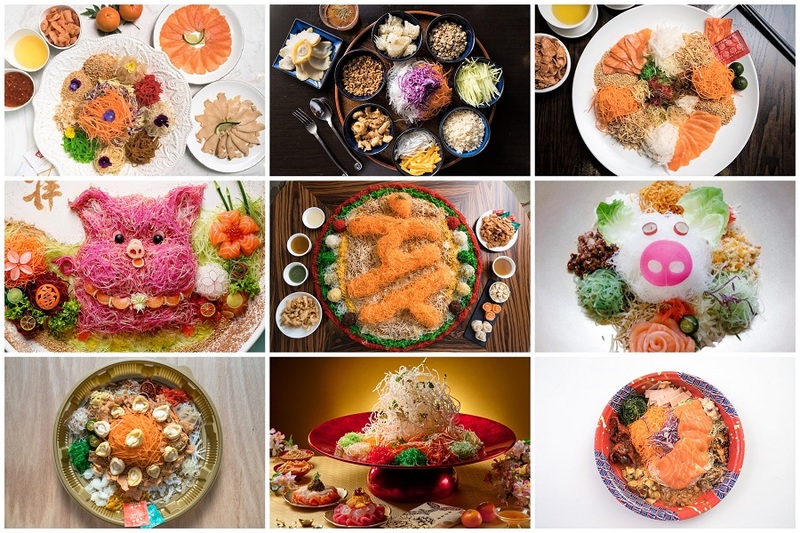 If you are looking forward to the “crunch” to the Yusheng, crispy fish skin is added to further symbolize “Nian Nian You Yu” (年年有余) or abundance. 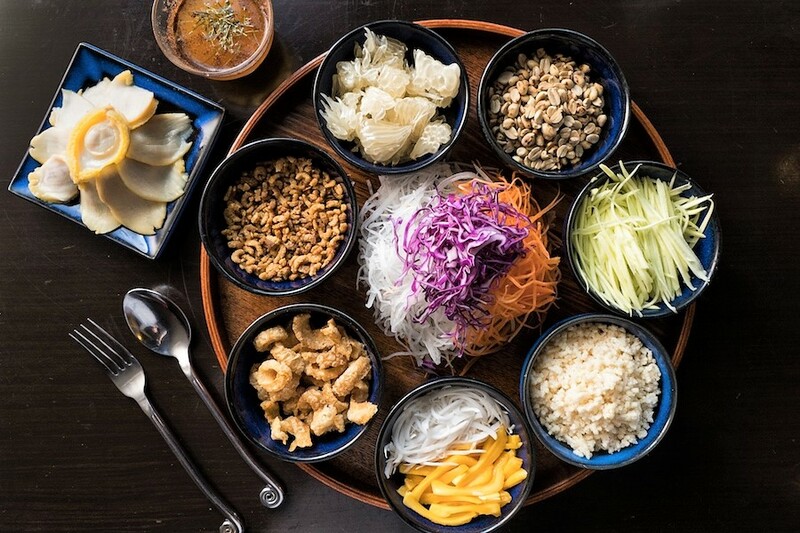 As for the dressing, customers will be given a choice of either traditional Yu Sheng sauce, or a sweet and zesty Kumquat sauce that represents “Da Ji Da Li” (大吉大利) or prosperity. 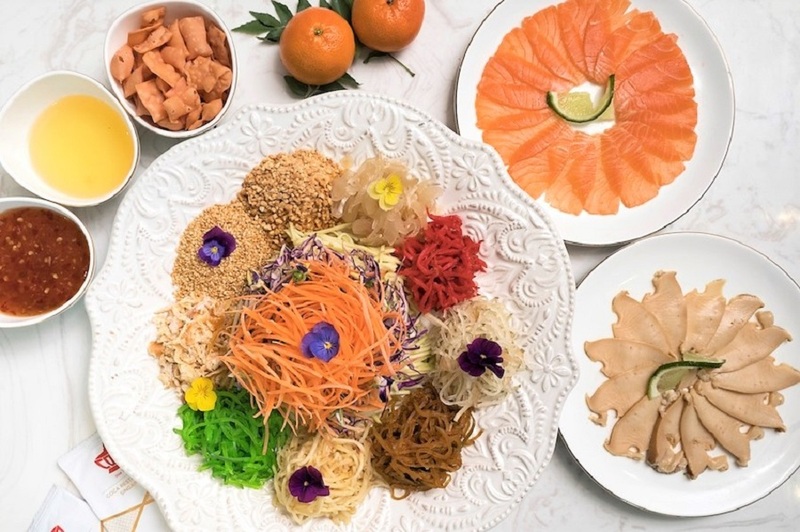 Other than this luxurious Yusheng, other new creations at Wan Hao Chinese Restaurant include Mini Abalone and Crispy Fish Skin Yu Sheng ($88, $158); Sea Urchin, Tuna and Crispy Fish Skin Yu Sheng ($88, $158); Smoked Duck Breast and Crispy Fish Skin Yu Sheng ($68, $128); and Assorted Fried Mushroom Vegetarian Yu Sheng ($68, $128). *Last collection at Wan Hao Chinese Restaurant on 4 February is at 3pm. 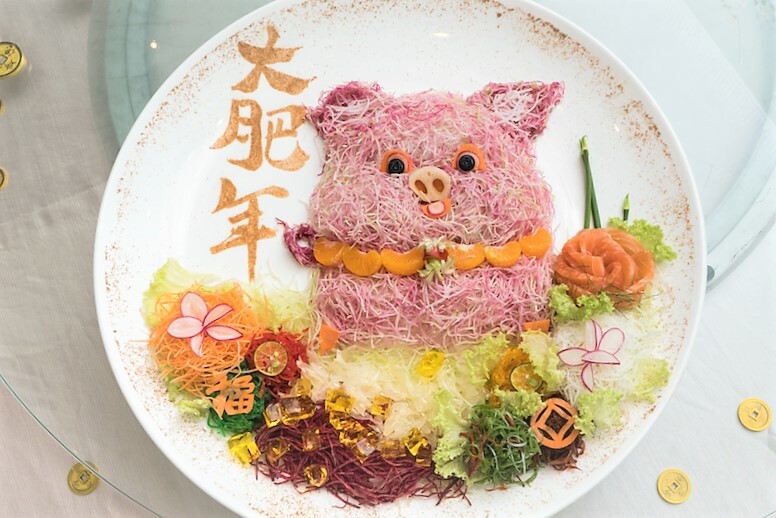 This pretty-in-pink Yusheng masterpiece comes artfully arranged to resemble a cute piglet – representing the Lunar Year of the Pig. It is an operation that requires 1.5 hours to prepare and assemble. The pink colour comes from the special beetroot radish, which is not common on the market. Other than the colour characterising the pig, this shade of pink is both auspicious and visually endearing. Expect luscious slivers of Norwegian salmon served with the pink and white radish, beetroot, cucumber, carrots, capsicum and Chinese parsley in this Yusheng. The one special feature is the house-made Champagne Jelly with edible gold leaf, symbolising wealth. The celebratory Champagne Jelly with edible gold leaf is really special as all the “gold” is placed within the jelly and not “scattered” around. As such, customers can both see and taste the “gold”. 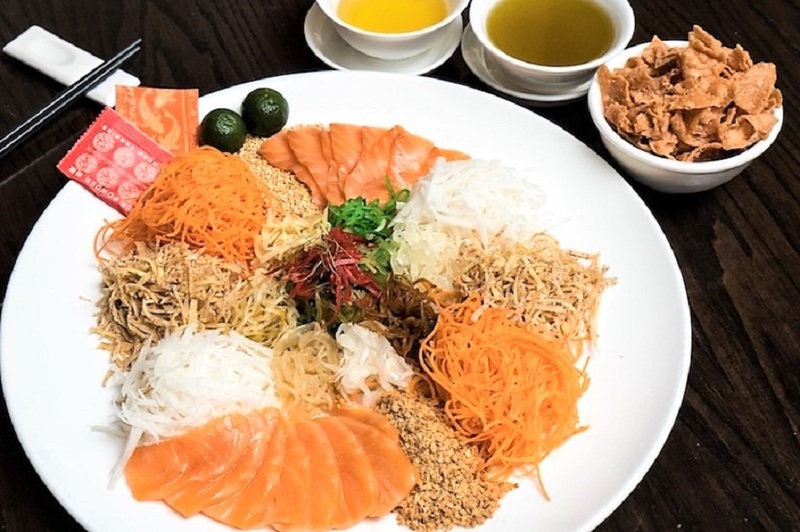 The Yusheng plate contains salmon while you can add on lobster ($58 per plate), abalone ($48 per plate), tuna ($28 per plate) or additional salmon ($28 per plate). 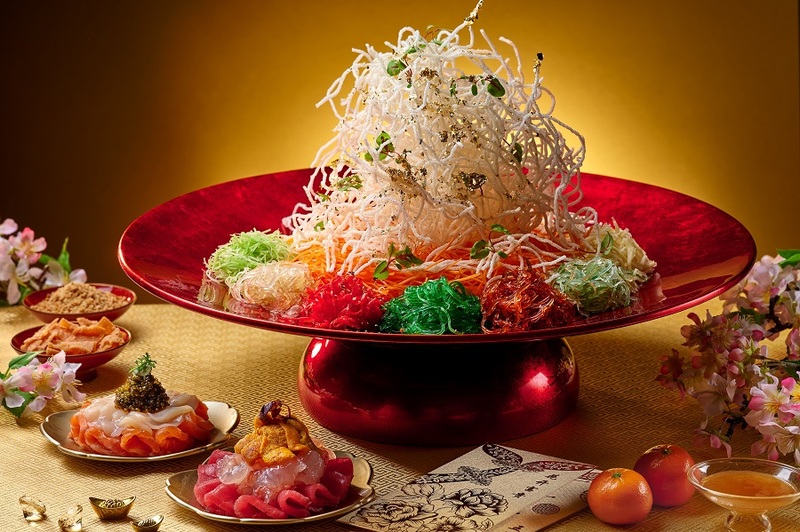 Alternatively, try the Gold Rush Yu Sheng ($118 for 6-8 pax, $138 for 9-11 pax). This Yusheng features Norwegian salmon served with pink and white radish, beetroot, cucumber, carrots, capsicum and Chinese parsley; the house-made Champagne Jelly with edible gold leaf; and the signature honey pineapple sauce to be drizzled over. The Special Piggy Edition Gold Rush Yu Sheng is available only for dine-in from 21 Jan to 19 Feb 2019; orders must be made two days in advance. 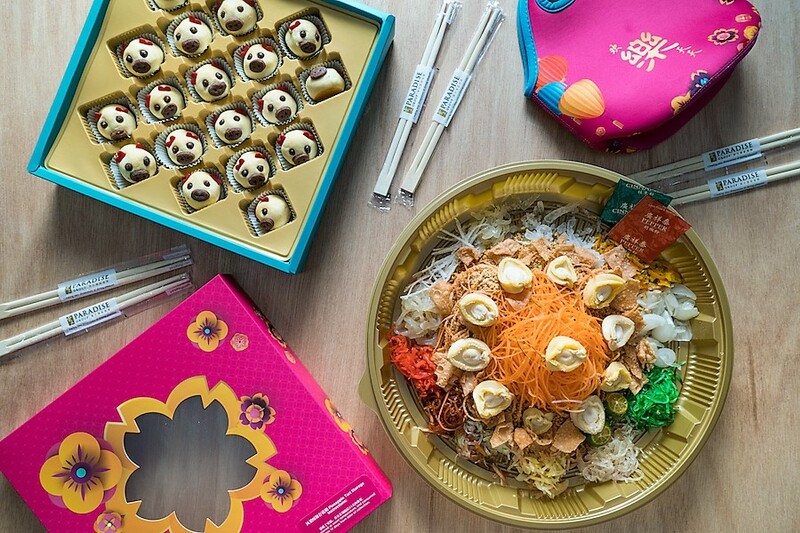 Orders for the Gold Rush Yusheng must be made one day in advance; this is available for dine-in from 21 Jan to 19 Feb 2019 and takeaway collection from 25 Jan to 19 Feb 2019 (the last day for takeaway orders is 16 Feb 2019). What’s a Chinese reunion dinner without a huge platter of yusheng in a vivid palette of colours of texture? 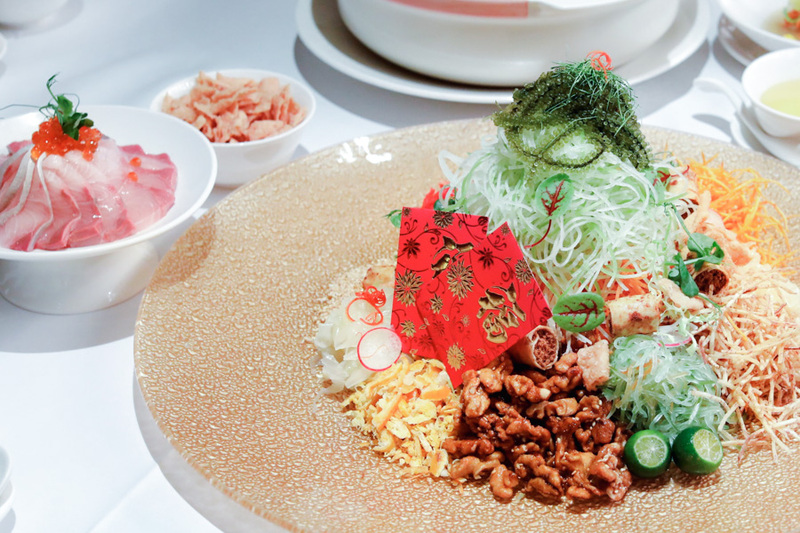 The Auspicious Hamachi Yusheng, created by Crystal Jade’s Group Executive Chef Martin Foo, is a play on novel ingredients, flavours and textures. It features a selection of seafood including salmon roe and sea grapes (umibodo), providing a burst of briny flavour. The quintessential fresh carrots and turnips, julienned-cut in precision, are beautifully plated along with colourful pickled items, with a sweet piquant taste that contrasts the salty sea grapes. To add crunch, pork floss rolls are added, a fitting welcome to the Year of the Pig. 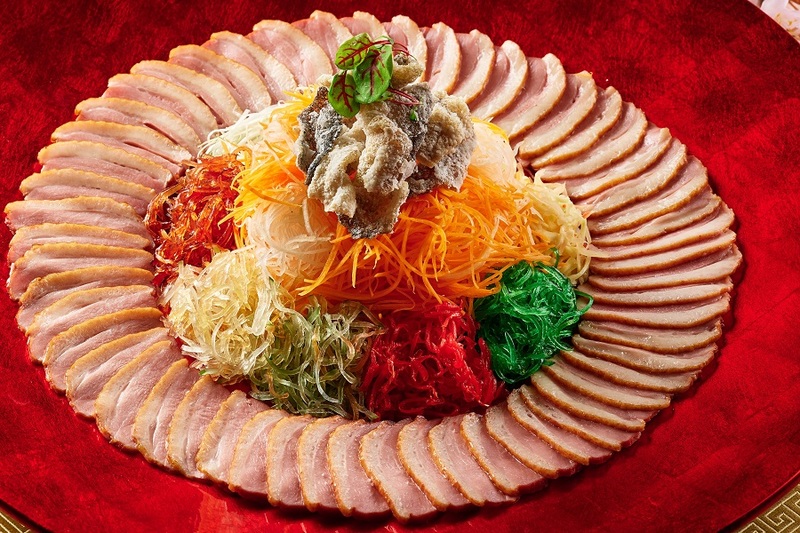 Chinese New Year isn’t complete without the iconic Yu Sheng, a timeless must-have piece of edible art. 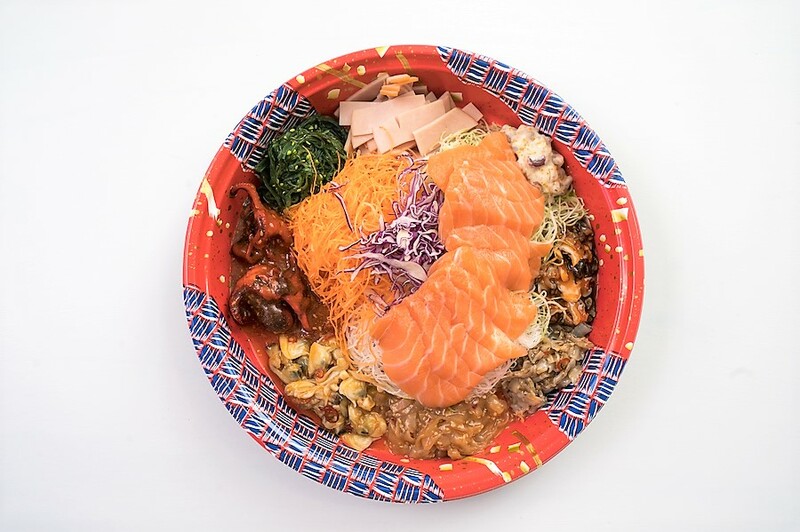 TungLok Group’s Prosperity Yu Sheng is a lush assembly of finely shredded fresh vegetables, mushrooms, yam, and sweet potato shreds, with Norwegian salmon. Only Smoked Norwegian Salmon are used, in which the salmon are sustainably farmed which delivers clean taste and pleasant texture. The combination is drizzled with TungLok’s new and improved Yu Sheng plum sauce. 15% OFF early-bird offer for takeaway orders on Yu Sheng, Pen Cai and Take-Home Feast for orders placed before 31 January 2018. This is quite a value-for-money Yusheng, as it includes a whole can of abalone, and can serve up to 10 diners. Other than the abalone, the Prosperity Yusheng includes a medley of vegetables freshly prepared upon order in the kitchen. The sweet and sour Yusheng sauce is specially created in-house by Paradise Group, so that the taste would be balanced and not overly sweet. If you are hunting for some CNY goodies, consider the cutesy-looking Piggy Pineapple Pastry (18pcs for $29.80) which will be a talking-point among guests. 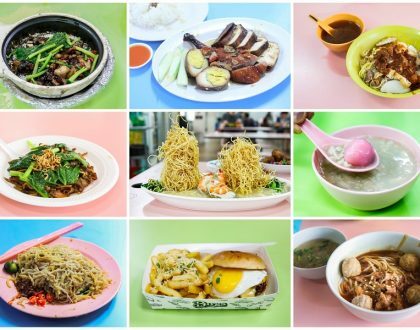 Available for takeaway at Seafood Paradise, Taste Paradise, Paradise Teochew, Canton Paradise(MBS, Bedok Mall & I12 Katong outlets) Paradise Hotpot and Beauty in The Pot (excluding VivoCity) outlets from 4 January to 4 February 2019. 10% off for all Citibank and Standard Chartered Credit or Debit cardmembers; 15% off for PGR members (for cakes & pastries only). Prices are subject to 7% GST. Available till 19 Feb 2019 for takeaway only (while stocks last). 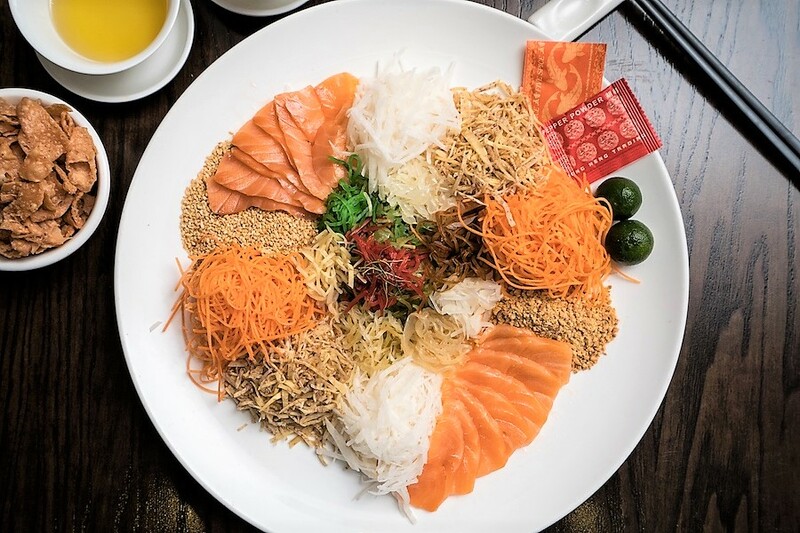 Rather than coming up with funky Yusheng, Imperial Treasure decides to stay true to their roots and tradition, offering the classic Yusheng with quality ingredients and toppings of carrots, radish and crispy shredded yam. One of their main differentiating factors is the use of smoked salmon instead of salmon sashimi, to cater to diners who are not fans of raw food. The Prosperity Yu Sheng featuring a medley of refreshing flavours and colours, is included in all dine-in set menus, and is also available for takeaways. For a more luxurious offering, get the option with additional servings of abalone. Also offered is a Vegetarian Yu Sheng (Small $32.80++ / Big $62.80++). Other Chinese New Year highlights include the Imperial Treasure Pot (Small $268++ / Big $428++), Abalone Treasure Pot (Small $348++ / Big $560++), Round Carrot Cake, Round Glutinous Rice Cake, Round Yam Cake, Round Chestnut Cake (from $23.80), Pineapple Cakes and Pineapple Pastry (from $14.80++). Symbolising completeness, the Imperial Treasure Pot is filled with quality ingredients such as superior whole abalone, sea cucumber, premium fish maw, Japanese dried scallops, Chinese dried oysters and dried mushrooms. Great for the family. Prosperity Yu Sheng is available for dine-in at all Imperial Treasure restaurants listed above (included in all set menus) or takeaway from 12 Jan to 19 Feb 2019. For more information, visit www.imperialtreasure.com. 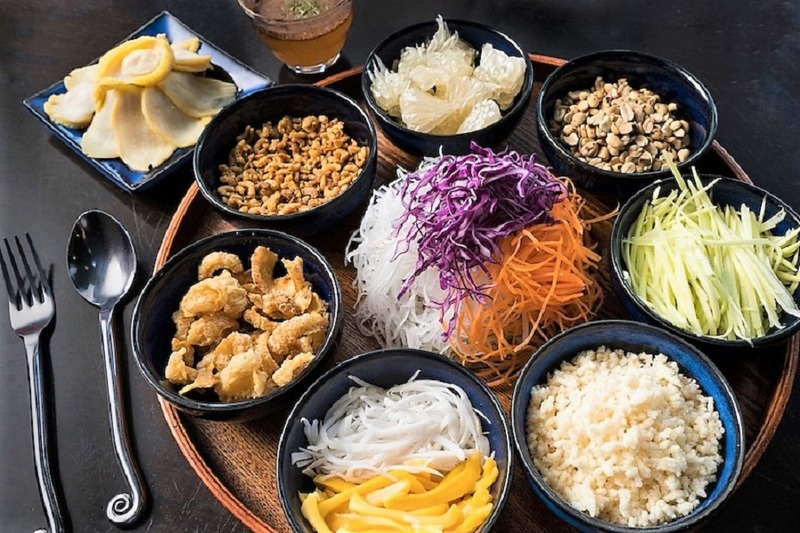 Perhaps more well-known for Thai-style ‘Suki’ Steamboat, COCA has also introduced their very own rendition of prosperity Yusheng with a Thai-twist. Drawing inspiration from the iconic Thai Mango Salad, shredded mixed fruits are used as a base, topped with freshly sliced assorted vegetables such as carrots, purple cabbages and pickled ginger to add a refreshing crunch. 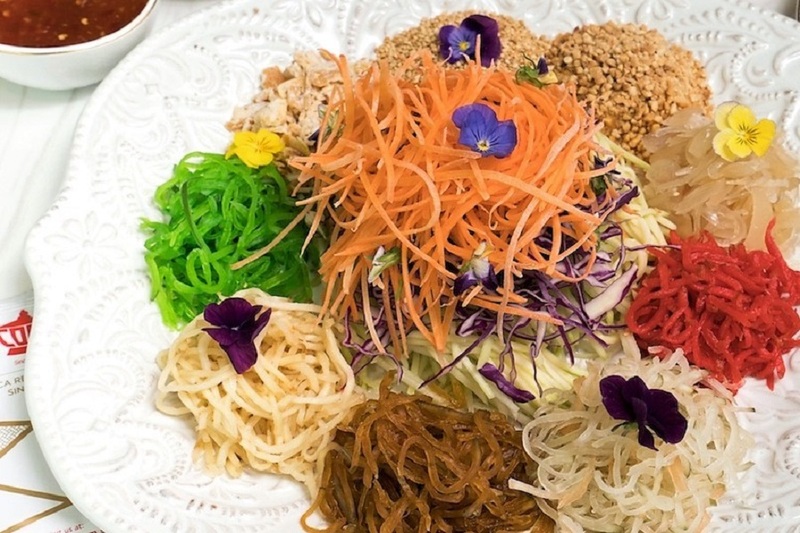 The Yusheng is further garnished with edible flowers that are commonly used in Thai food and beverages, which literally symbolizes “Hua Kai Fu Gui” (花开富贵) or ever-blooming fortune. Also adds brownie points for “instagrammability” factor. Before tossing, the auspicious treat would be drizzled with COCA’s house-concocted Thai sweet sauce for tangy-sweet en-Thai-cing finish. Get 15% OFF for Yusheng TAKEAWAY when you quote ”DanielFoodDiary” upon placing an order. Available till 19 Feb 2019. GST & $2 takeaway container charge applies. Mala Yusheng? The love (and craze) for Mala is not limited with the usual Mala XiangGuo and Mala Hotpot. 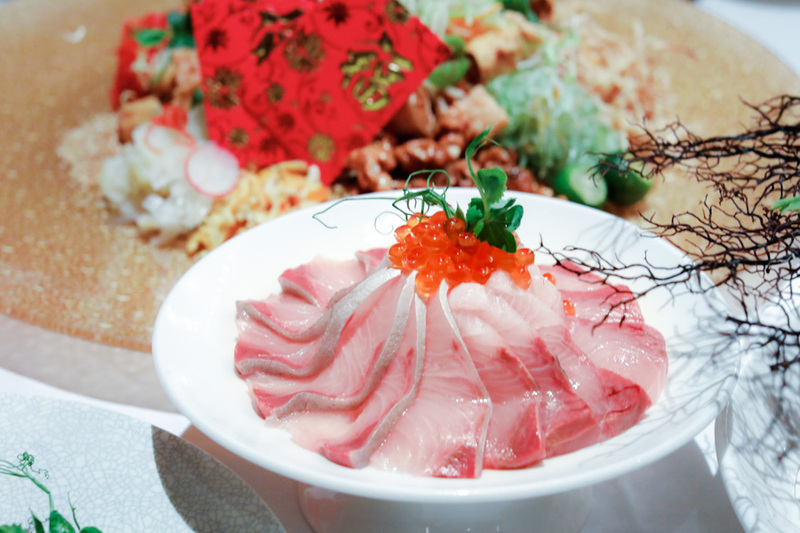 This year at Sakae Sushi, expect the Yusheng to have Chinese (Sichuan), Korean and Japanese elements. What you have include Chinese influence of “Mala” clams, Korean Kimchi Topshell, along with Sakae Sushi’s classic Japanese toppings of Chuka Kurage, Chuka Wakame, Chuka Hotate and even sliced chicken ham. Instead of the usual sweet and savoury Yusheng, this spicy version is unique and different from other traditional ones, leaving quite a lasting impression and kick on the palate. 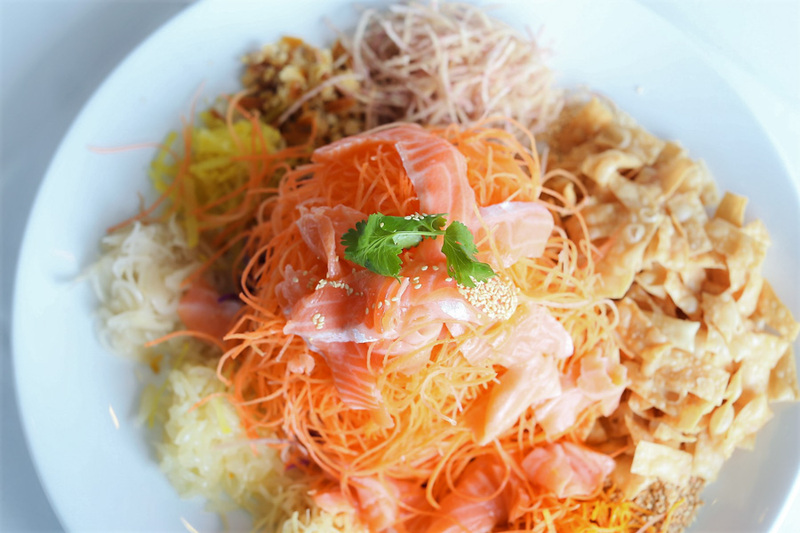 If you prefer something more classic, get the Rong Yusheng included with fresh air-flown Norwegian Salmon Sashimi slices. This is presented with white radish, carrot, ginger, melon, brown melon, vegetable, lime strips, chuka kurage and cucumber and red cabbage strips. Get a $20 complimentary voucher for your next visit when you purchase a M-size ($49.88), or 2X $20 complimentary vouchers with a L-size ($62.88) Rong Yusheng. For a festive bundle, get the Fortune Combo (Member $170 / Public $180) which comprises of a Longevity Rong Yusheng, a Spring Blossom Platter and a Sakae Prosperity Platter; or a New Year Reunion Combo (Member $158 / Public $168) which includes a Longevity Rong Yusheng, a Sakae Prosperity Platter and a Blessing Agemono Platter. What To Say During Lo-Hei. Hope this is useful! All toss the salad an auspicious 7 times. Ingredients to be pushed towards the centre to claim good luck for all at the table. Huat ah! 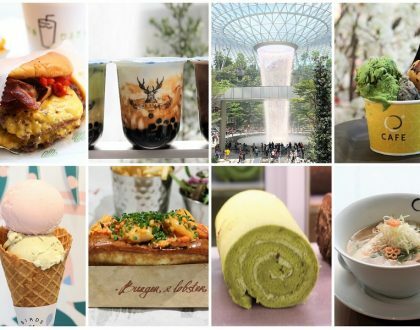 * Compiled by Nicholas Tan @stormscape and Daniel Ang @DanielFoodDiary. 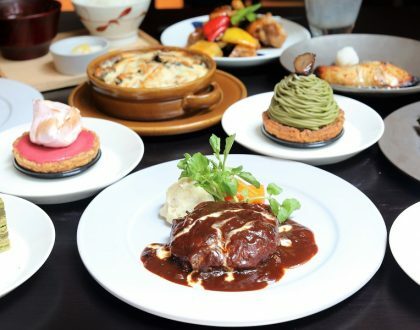 This post is brought to you in partnership with COCA Restaurant, Crystal Jade, Imperial Treasure, InterContinental Singapore, Paradise Group, Sakae Sushi, Sawadee Thai Cuisine, Singapore Marriott Tan Plaza Hotel, The Fullerton Hotel Singapore, TungLok Group.